Efrat Mayor Oded Ravivi, who heads the Yesha Council's foreign affairs desk, penned a letter thanking United States Ambassador to Israel David Friedman, after he harshly criticized the Palestinian Authority for glorifying Tuesday's murder of Rabbi Raziel Shevach near Havat Gilad. Ravivi wrote that "We thank you for your words of consolation and appreciate your stance against Hamas and against the encouragement of terror by the Palestinian Authority and we hope that others will follow your path". Ravivi added that he hoped that the Yesha Council and Friedman would cooperate together in the future. "It's important for us here in Judea and Samaria, in addition to the rest of Israel, that we show our support for those who stand by us," said Ravivi. "If we publicly support those that stand with us the way Friedman does, it will give them the power to oppose those that attempt to convince them otherwise." 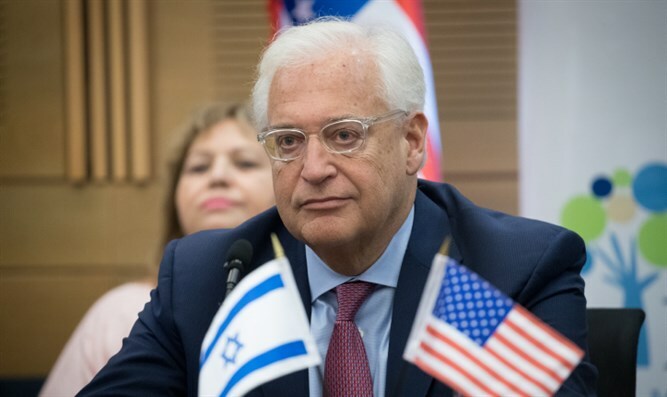 Friedman had criticized the Palestinian Authority and the Hamas terror group after the attack and blamed them for a string of recent terror attacks. "An Israeli father of six was killed last night in cold blood by Palestinian terrorists," Friedman said. "Hamas praises the killers and PA laws will provide them financial rewards." "Look no further to why there is no peace." Friedman added that he is "praying for the bereaved Shevach family." Friedman's remarks were echoed by US President Donald Trump's special envoy to the Middle East Jason Greenblatt, who tweeted that "this violence and horrific glorification will only incite more attacks and rob Palestinians of the chance for peace. I pray for the Shevach family.‏"
The PA accused Friedman of being “biased” in favor of Israel in response. “The American ambassador in Tel Aviv is known for his selective positions, biased from the outset, which reflects a positive disposition towards the occupation and the settlements and alienation from the problems of our Palestinian nation and our just and legitimate national rights,” it said in a statement.